Norske Skog Golbey is active in its territory and committed to promoting the circular economy and partnerships. In an age where the newsprint market is getting harder, local industrial ecology is taking on crucial importance. The Green Valley cluster is a concrete application of the principles of industrial ecology. Its form is particularly atypical, because it is designed to serve local economic development. 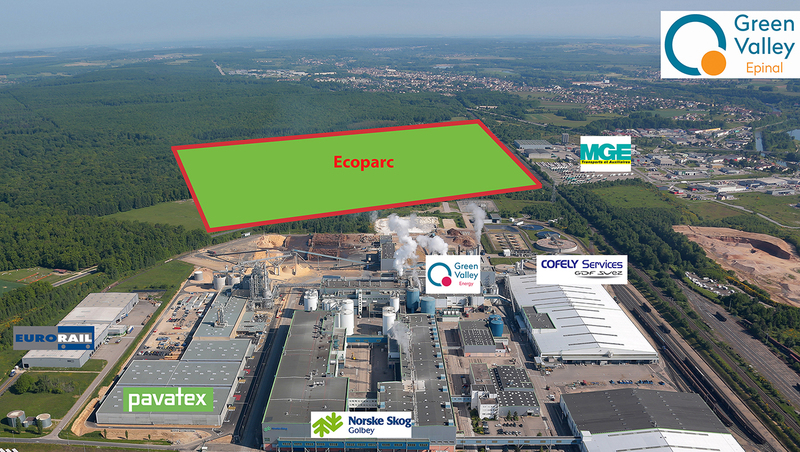 It is the result of partnership between the Epinal-Golbey Société d’Economie Mixte (SEM), private companies and our paper mill. The shared objective is to create new business in the eco-materials sector. Beyond business aspects, the synergy generated in Green Valley has allowed significant reductions in the carbon footprint. Indeed, the industrial synergy developed to date with Pavatex has made it possible to avoid the use of an independent gas boiler thanks to the reuse of unavoidable energy from the papermaking process (steam) for manufacturing wood fibre insulating boards. Work will continue through the development of an “Ecopark” near the site. The most significant project to date resulting from the Green Valley is the installation of Pavatex, which produces insulating wood fibre boards. In 2013, the Pavatex project represented a €60 M investment and led to the creation of 50 direct jobs. The employees were recruited locally. The arrival of a new manufacturing company in the area gave a boost to business with local industry and service providers (indirect jobs). In November 2014, when it first took part in the Enterprise and Environment Prizes organised by the French Ministry for the Environment, Sustainable Development and Energy in partnership with ADEME, Green Valley was extremely proud to receive First Prize in the Circular Economy category. The prize was officially awarded at the Pollutec fair in Lyon in December 2014.